Finished the first of my "holiday" socks last night - the knitting was already done, but I didn't take a sewing needle with me so couldn't do the toe. At the last minute, I changed my mind and left the green lace socks at home, thinking the pattern was way too complicated for me to do in anything less than peace and quiet. So, I started this pair for Mark, in the same Fortissima Socka yarn as the Jaywalker, but blue, using a pattern from Sensational Socks. The pattern is a false cable and is just the right balance between interest and mindless. Did a traditional heel on this one too, since he finds the short row heels make for difficulties getting socks on and off. 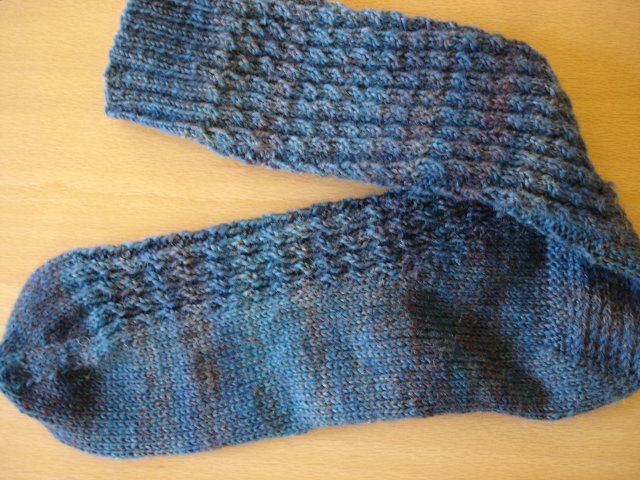 The cable pattern makes the finished sock very long and narrow, so I had to fold it to get it into the picture! Have started the second one already - can't have two cases of SSS at once.